Sri Dilip Kumar Roy has brought together in this book the records of his conversations and correspondence with some of our great contemporaries: Romain Rolland, the artist; Gandhi, the saint; Bertrand Russell, the thinker; Rabindranath Tagore, the poet; and Sri Aurobindo, the seer. 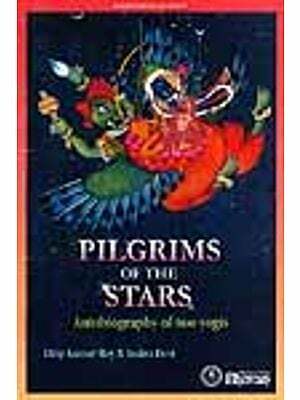 The author is the tirthankar, the pilgrim in quest of truth, the seeker of wisdom and he calls his book Among the Great. Sri Dilip Roy’s teachers, except Bertrand Russell, believe in a Godhead which is the unmanifested principle of all manifestations and in the capacity of human beings to love, know and become assimilated to the Divine nature. To achieve this contact or communion is the final end and purpose of human existence. All these five teachers hold that humanity does not yet exist, that it is laboring, that its ideal defines itself only progressively. Humanity is in the making and requires to be made. This means a new discipline, a new law or dharma which must be followed and the way is profoundly and profusely illustrated in the writings of Sri Aurobindo. We are greatly indebted to Sri Dilip Kumar Roy for giving us this invaluable book, written with a rare case and charm and ennobled by a deep moral concern for the good of humanity. I was thirteen then, in 1910, when I came upon Sri Ramkrishna Kathamrita (talks of Sri Ramkrishna Deva) translated subsequently by Swami Nikhilananda under the title, “Gospel of Sri Ramkrishna.” I was indeed fascinated even though I was somewhat sceptical about its authenticity. A cousin of mine contended that it was a faithful record of the Sage’s sayings because Sri Mahendranath Gupta, the chronicler, had kept a meticulous record in his diary of all that he used to hear from day to day, and that his memory was wonderfully reliable. I decided to verify, the more as Sri Mahendranath happened to be al preferre most a neighbour of ours. He flushed with pleasure and shouted: “Prabhash! Prabhash! Just come, run! Look, this little boy has come to hear from me about Thakur, fancy that!” Then turning to me: “Look, how my hair has stood on end!” And I looked in amazement: his body was indeed quivering with ecstasy and every single hair on his hand had stood on end! Also his eyes glistened with unshed tears. I was dumbfounded. “What Gurubhakti!” I said to myself. “Shall I be able to have such a devotion to my Guru when he will appear before me?” “Not likely,” came the instant answer from within, “devotees are born and not made and, besides, you are too sceptical by nature to be able to let faith in, not to mention bhakti” And I mused on the verge of tears till he called me back from my reverie by placing on my lap, gently and reverently, his treasured diaries, bound in morocco, wherein lay recorded, for all times, the jewelled sayings of one who revolutionized the lives of millions all the world over. “Request!” I stared at him in blank amazement. I do not know what impelled him to make such a strange request to a mere schoolboy. Can it be that a hero-worshipper bows a hero- worshipper when he sees one? Or maybe he felt something! I cannot tell. All I can say is that I have never been able to forget my promise to him. This is the genesis of my present book. I must acknowledge one more debt; to my dear friend, Asit Kumar Gupta, whose remarkable flair for style and the mots justes I have profited by in this edition while he read through the proofs with me. Sri Dilip Kumar Roy of the Aurobindo Asram, Pondicherry, has brought together in this book the records of his conversations and correspondence with some of our great contemporaries, Romain Rolland, the artist, Gandhi, the saint, Bertrand Russell, the thinker, Rabindranath Tagore, the poet and Sri Aurobindo, the seer. The author, Sri Dilip Kumar Roy, is the tirthankar, the pilgrim in quest of truth, the seeker of wisdom and he calls his book Among the Great. The choice spirits whose considered convictions on many matters of vital interest and urgency are set forth in this volume are men of deep humility and profound insight, who are released from sectional views and have won through to illimitable horizons. They have wrestled with the central problems of life and reached decisive certainties. No one with a spark of spirit in him can help raising those central questions of life and thought which have engaged the attention of the great thinkers of the past. Who am I? From what causes do I derive my existence and to what conditions do I return? What beings surround me and what is my relation to them? Kant stated the chief problems in the form of three questions. What can I know? What ought It do? What may I hope for? The five outstanding personalities have pondered over these last uncertainties and after much toil and tribulation arrived at comprehensive views which rescue them from the strife of competing half-truths and the weariness of unrelated knowledge. A world troubled almost to despair by the tragedy of recurrent wars makes them burn with rage against the lack of contact between the principles of the religion we profess and the social action that should accompany it. The opening chapter brings back to us memories of Romain Rolland’s recent death and his courageous allegiance to universal values which meant so much to so many in the war years. He tried to see the world and its tragedies with a timeless vision. He made his mark first in 1903 with his life of Beethoven, “the most heroic force in modem art, the best friend of all those who suffer and struggle.” This book attracted the attention of a much wider public than that of students specializing in music. Romain Rolland loved music not only as an art but as a sadhana which is victorious over time and its frontiers. He started in 1904 the publication of his famous Jean Christophe, who was himself a musician and a sufferer and the last volume of this great work appeared twelve months before the 1914 war. In spite of the war, Romain Rolland kept his faith in the victory of spirit and the greatness of man. He could have said of himself what he made Jean Christophe say, in the words of Anti-gone, “I was made for love and not for hate.” Through his works, we realise that the spirit of man is the same everywhere whether in the East or in the West. “There is neither East nor West for the naked soul; such things are merely its trappings. The whole world is its home. And as its home is in each one of us, it belongs to all of us.” It is no wonder that he was attracted by the ancient wisdom of India as illustrated by Ramkrishna, Vivekananda, Tagore, and Gandhi. “Oh Tagore, Oh Gandhi, rivers of India, who, like the Indus and the Ganges, encircle in your double embrace the east and the west—the latter, Mahatma, master of self-sacrifice and of heroic action—the former, a vast dream of light—both issuing from God Himself, on this world tilled by the ploughshare of Hate.” He longed to come to India though the visit never came off. In a letter be wrote to Tagore, dated 11th June, 1923, he said “Dear Friend, how much I would like to come and see you in India. All the movements of my mind tend towards that direction. I fear I shall not be able to carry out this plan this winter. But I hope for voyage to Asia and a stay at Santiniketan. I have so much to learn from you! And I believe that I shall have there a mission to fulfill, a predetermined duty till the end of my life. The union of Europe and Asia must be, in the centuries to come, the most noble task of mankind. As for myself, India from now on is not a foreign land; she is the greatest of all countries, the ancient country from which once I came. I find her again deep inside me.” Romain Rolland was an apostle of reconciliation. “Let us endeavor to bring together once again the great Indo European family which has been so criminally sundered by space.” No great work is ever accomplished in this world save by those who have faith in mankind, faith in something higher and greater than mankind, which is yet present to mankind. Romain Rolland bore witness to this faith in all his work. If “the greatest artist is he who lives the finest life,” then Gandhi has a claim to that title. “What is art but beauty in simplicity and what is asceticism but the highest manifestation of simple beauty in daily life, shorn of artificialities and make believes?” Gandhi’s life is at once art and asceticism. He believes all that he professes and practises all that he enjoins. Gandhi applies the technique of redemptive suffering for the removal of injustice and exploitation. While he is essentially a servant of humanity, he works for humanity from the platform of India. We need not cut down the tree to gather the fruit. In order to perfect human society, it is not necessary for us to destroy the family or the nation. We have to transform them by developing them in the right direction, by stifling the selfishness which corrupts them at the source. Patriotism is not a vice to be eradicated but a force to be employed in the service of world community. When Gandhi fights for the freedom of India, he does so in no narrow spirit. Freedom for him is not merely the acquisition of political power, but is the advance into a new life, when all things will undergo transformation and all forms of human oppression will cease. This will mean a new education, a new discipline, a devotion to God and a selfless service of men. Sri Dilip Roy’s account of Bertrand Russell shows that it is not necessary to agree with a person in order to admire him. Sri Dilip Roy is of the view that the higher human values, the aesthetic sense, the moral consciousness and the religious intuition cannot be explained in terms of material, mechanical or naturalistic evolution and so thinks that the scientific humanism of Russell which endeavors to explain these values in terms of naturalistic evolution is not more satisfactory as a metaphysical creed than the cruder materialisms. 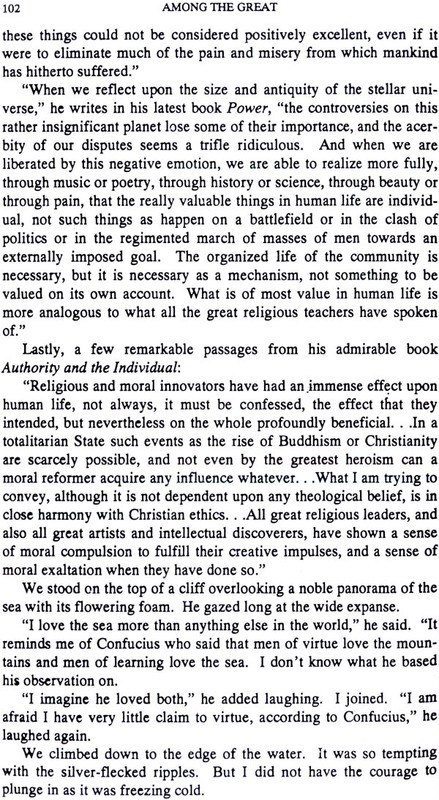 If a desire to worship and a faith in a sustaining presence are the marks of religion, Bertrand Russell cannot be said to have felt the spirit of religion. He impresses on us the transience of earthly things without any compensating vision of a treasure in heaven. He, however, exhorts us to be good and compassionate. Russell does not seem to realise that the human individual who can sit in judgment on the universe, who has the intelligence to know that his life is but a brief episode in the history of this planet, who has developed a conscience which protests against the waste and want of the world, is not a mere phenomenon among phenomena, an object among objects. If he were only that, how could he have faith in his hours of despair? Russell’s humanism may prepare us to die with dignity but does it inspire us to live with hope? 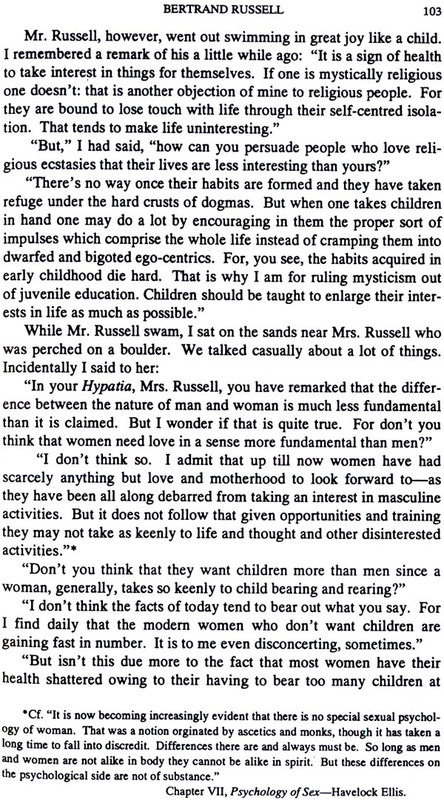 When Russell asks us to “shed sunshine on the path of our comrades, to lighten their sorrows by the balm of sympathy, to give them the pure joy of a never tiring affection, to instil faith in hours of despair,” he encourages us to think that we can do much for the improvement of the human race, and that some sound instinct urges it. Let us help it, let us work with it. There is a realisation of God which we can achieve through saving the future of humanity on this planet, a realisation to which humanity aspires. Rabindranath Tagore was the greatest figure of the Indian Renaissance who shed a glow of illumination on the age in which he lived, one of those rare men about whom it may be said without any exaggeration that neither his own generation nor another will look on his like again. He was essentially a poet and so sought for fulfillment, not in escape but in activity. He lived and worked for freeing the mind of man. He wished to arouse mankind to a constant vigilance against the insanities, injustices and confusions which, in one form or another, threaten human society from within. While he fought against the exploitation of India by others, he fought equally against the inward slavery of the Indian mind. If we are to dethrone the despot outside, we must destroy the throne within ourselves which we have built for him. No tyrant can rule the free in mind. Through his Visvabharati, Tagore laboured for a world-commonwealth whose foundations rest upon a universal moral law. Sri Aurobindo the seer, claims the wholehearted allegiance of our author. Sri Aurobindo is a great example of the intellectual robustness of mystical souls, whom we approach not so much to partake of their intellectual subtleties as to receive the word of life. The serene elevation of his thought, the vast erudition which he veils with the height of superb art, the witness of his spirit to the life divine, all these qualities are brought out in the extracts reproduced in the fifth chapter. We are at the beginning of a new era. The chaos, and the confusions caused by the present tangle are in striking contrast to the scientific achievements which have turned distance into nothing, which have enabled us to circle the globe within a week and carry on conversation on the long distance telephone between places as far removed as Calcutta and San Francisco. The miscarriage of the world is the result of the dissociation in the mind of man, in the disrupted consciousness which has pervaded our thought all these centuries. So long as men with distorted vision seize and retain power, the future of humanity will be in peril. The central need of contemporary man is integration, the achievement of harmony within himself which will be reflected in his relations with the world. To usher in the reign of the integrated man is the main purpose of Sri Aurobindo’s life and teaching. The word of God is dynamic and continuous. The Divine spirit overbroods and indwells the soul of humanity as a whole. History records the stages of man’s education. The saints and seers of mankind in every age have made articulate the growing word committed to the living soul of man, interpreting to the peoples those truths and principles of which they were themselves aware only as a vague aspiration, or an indefinable discontent. Sri Dilip Kumar Roy’s teachers, except Bertrand Russell, believe in a Godhead which is the unmanifested principle of all manifestations and in the capacity of human beings to love, know and become assimilated to the Divine nature. To achieve this contact or communion is the final end and purpose of human existence. All these five teachers hold that humanity does not yet exist, that it is labouring, that its ideal defines itself only progressively. Humanity is in the making and requires to be made. This means a new discipline, a new law or dharma which must be followed and the way is profoundly and profusely illustrated in the writings of Sri Aurobindo. We are greatly indebted to Sri Dilip Kumar Roy for giving us this invaluable book, written with a rare ease and charm and ennobled by a deep moral concern for the good of humanity.